Hello all! I belong to a few different cake organizations and one is a great discussion group on Facebook. It’s a fantastic place for us to discuss the finer points of pricing, client relationship management, baking, construction, new tools, and everything interesting to cakers like me. Recently a common theme in posts has been cake pricing, and the chasm of difference between public perception of cake costs (low) and actual cake costs (not low). 75% of my job is education and I embrace that. 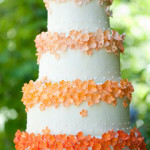 Most clients have never ventured into the world of cakes over $50. So I feel like it’s my job to help educate and inform about all the different aspects of high-end cake making. There is a general awareness that getting a custom cake made for a special milestone event costs more than expected, but sometimes the actual price can be a shock. …and so many more. You get the picture. 1. Wedding cakes cost more than other cakes. For us, not true. So not true. 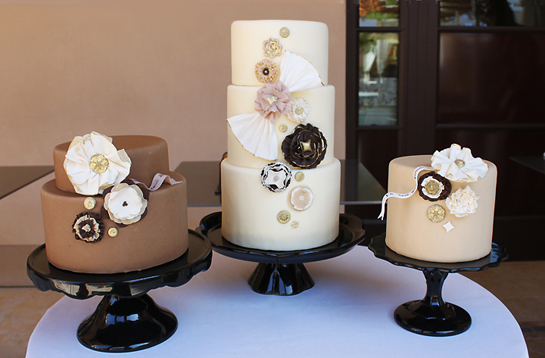 All our custom cakes are charged the same way at the same price (on a per-person basis) no matter the occasion. I don’t know any cakers worth their salt in Southern California who would swindle a client like this. Maybe in the old days this happened, but not anymore. 2. Round tiers cost less than square tiers. This one’s actually true. But what’s not clarified when you hear this is that *round tiers feed less people than squares. * So when we charge on a per-person basis, of course round tiers will cost less — because they *feed* less. Ultimately you should order the shape you like — you’ll still need to feed the same number of people in the end. 3. Fake (styrofoam) tiers cost less than real tiers. For us, not true. The cost of a cake resides mostly in the effort and time involved in decorating the exterior. The interior, cake or not cake, is the least-expensive factor in our calculation. By the way, those styrofoam “cake dummies” are not inexpensive — it costs a shiny dime to source, buy, and have them shipped. If they arrive dented, guess what? We have to spend time returning and getting a new one for you. Then we have to cover it with fondant, which is actually trickier than covering a real tier due to its lightweight nature. That thing will scoot all over the table while you’re trying to cover it! Especially the smaller ones. 4. A “simple” design means lower pricing, right? Well, that depends on how you define “simple.” In the words of Inigo Montoya from the movie The Princess Bride, “You keep using that word. I do not think it means what you think it means.” An all-white cake with white sugar lace and a white sugar flower cluster looks very simple and clean. So does an Art Deco style cake. Yes they’re simple and beautiful to look at, but these are not simple to create. For us to make a cake like these is actually harder because all errors will show. Especially with a very orderly design like a stripe, Art Deco motif, or other math-heavy repeating pattern. If one soft piece of sugar decor is dented, smudged, or slightly tilted, it will stick out like a sore thumb, ruining the look. Not Superfine! 5. You can save on delivery by picking up the cake. Cakes three tiers and taller have an increasingly higher center of gravity, making them more prone to leaning and toppling on a vigorous drive. Cakes are very susceptible to heat damage. If a cake is in a warm car, it will melt. If a cake is left in direct sun, it will melt. It’s a cake — it melts in ambient or direct heat over varying periods of time depending on the intensity of the heat. Is there a dead-flat surface to put it on in the car? The best spot for a cake is in the passenger footwell on a non-slip mat. Put that cake on even a slightly leaning surface (like a folded-down seat) and it will tend to lean and slide. Does the person picking up drive a smooth car smoothly? Cake safety is increased in a large non-sports suspension minivan or car driven by someone who takes turns slowly and stops very slowly over a long stretch. I grew up driving stick-shift sports cars, but I drive like a granny when I’m delivering cakes and keep a tally of how often I get the finger. I don’t care — as long as the cake is safe. I hope all of these help you when you’re thinking about your cake. If you have other myths or questions you’d like addressed, send us an email, drop us a line on our FB page at /Superfine Bakery, or Tweet us @superfinebakery.